1. Deep down he thinks he’s too much of a redneck to have got into Husker Du. 2. Syntax 1: His syntax is fascinating. Someone – can’t remember who – once said that ‘a poem should be a machine for re-reading’ and that’s what you do here. You read, you skate across the surface and then you re-read and it’s different the next time and you can’t get bored. 3. Syntax 2: Because of this, it sometimes seems like he’s put a real long scroll of paper into a typewriter emulator and just kept on Benzedrine-typing until he was finished. There’s a bit of craft at work here. Don’t get carried away with the Benzedrine. This isn’t just typing. 5. ‘On the bus, I pass through unobtainable wi-fi’ might be one of the best lines I’ve heard to sum up now, right now. 6. There are things here in this book. Things everywhere. Nouns. 7. There are unfashionable adjectives with fashionable nouns and fashionable nouns with unfashionable adjectives everywhere here. 8. 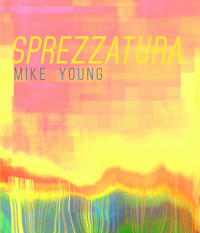 Mike Young is a poetic phrase-maker in a way you don’t see too much in contemporary literature/Alt-Lit etc. He’s bringing phrase making back and making it cool.